Savory Oven Pancakes look different from pancakes that are cooked on a griddle or stove top. Oven pancakes puff up in the oven and their outside crusts become wonderfully crisp and golden brown, yet their centers stay soft and tender. Now, after you take the pancakes out of the oven, their centers will slowly deflate leaving a cavity that is perfect for holding a couple of slices of bacon and a cooked egg. Or, instead of using bacon, you can sauté sliced shallots (or onions), mushrooms, peppers, and kale (or spinach). Place in the cavity with a cooked egg on top. Great breakfast or brunch dish. 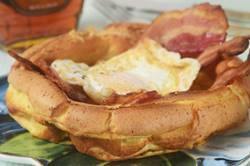 This Savory Oven Pancake is similar to a Popover or Yorkshire Pudding. The batter is easily made in a blender or food processor. When making Oven Pancakes you want them to really puff up during baking with a crisp outside crust. So, for this to happen the pancakes need to be baked in a hot oven. And you want to use cast iron skillets. (Although I like to make individual pancakes, you can use 1 - 8 inch (20 cm) cast iron skillet.) Before you add the batter to the skillets, you want them to be really hot. So place the skillets in the oven while it's preheating which takes about 10 - 15 minutes. Once the oven reaches the correct temperature, place a little butter in each skillet and let the butter melt in the oven (this prevents the batter from sticking to the skillets). Then quickly pour the batter into the pans. Before baking, for extra flavor, I like to sprinkle the tops of the pancakes with chopped chives and some grated gruyere cheese (or cheddar or parmesan cheese), but this is optional. Savory Oven Pancake: Preheat your oven to 425 degrees F (220 degrees C) and place the rack in the center of the oven. Place two - 5 inch (base of skillet) (12.5 cm) cast iron skillets in the oven while it's preheating. When the oven is at the correct temperature, place 1/2 tablespoon (7 grams) of butter in each pan. Return to oven and let the butter melt. Meanwhile, in your food processor or blender (can also use an electric mixer) place all the batter ingredients. Process for about one minute, scraping down the sides of the bowl as needed. Remove the pans from the oven and divide the batter between the two pans. If desired, sprinkle the tops with some chives (or chopped green onions) and grated gruyere, cheddar cheese, or parmesan. Bake for about 16 minutes or until the pancakes have puffed and are golden brown and crisp, yet the centers are still soft. Do not open the oven door until the end of the baking time or they may collapse. While the pancakes are cooking fry the bacon and cook the eggs. As soon as the pancakes come out of the oven, place the bacon and eggs in the center of each pancake. Serve immediately, with or without maple syrup.